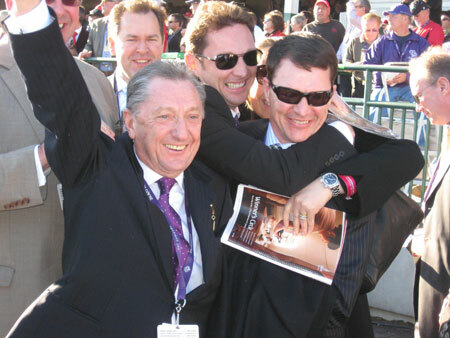 OK, so who’s the Eclipse Award-winning trainer this year? The usual names – Baffert, Asmussen, Pletcher, or Mott, all of whom had terrific years? Or perhaps Graham Motion or Dale Romans, who both had career years and won classics? Before deciding, voters should pay close attention to Aidan O’Brien, who could become the first foreign-based trainer to take home the award, just as the Coolmore gang – Mrs. And Mrs. John Magnier, Derrick Smith, and Michael Tabor – could walk off with the leading owner award. In a groundbreaking year, O’Brien, who trains out of the famed Ballydoyle training center in Cashel, Ireland, won seven grade I stakes in this country in 2011 with five different horses. He sent his 2010 Irish Derby winner Cape Blanco to the States on three separate occasions to win the Man o’War Stakes in July, Arlington Million in August, and Joe Hirsch Invitational Turf Classic in October. The 4-year-old had become the first horse in history to make three transatlantic flights to America in one year and win three grade I stakes. O’Brien also sent his 2011 Irish Derby winner Treasure Beach to Arlington to win the Secretariat Stakes, Together to Keeneland to win the Queen Elizabeth II Challenge Cup (one week after finishing second in the grade I First Lady Stakes at Keeneland), and Wrote and St Nicholas Abbey to Churchill Downs to capture the Breeders’ Cup Juvenile Turf and John Deere Breeders’ Cup Turf, respectively. But that wasn’t his only involvement in North America. In addition to Together finishing second in the First Lady, Misty For Me finished a fast-closing third in the grade I Breeders’ Cup Filly & Mare Turf, beaten only three-quarters of a length; Treasure Beach finished third in the grade I Pattison Canadian International Championship at Woodbine; Up finished fourth in the grade II Breeders’ Cup Juvenile Fillies Turf; Master of Hounds finished fifth, beaten 5 ½ lengths, in the Kentucky Derby; and So You Think finished sixth, beaten only 3 1/4 lengths, in the Breeders’ Cup Classic. 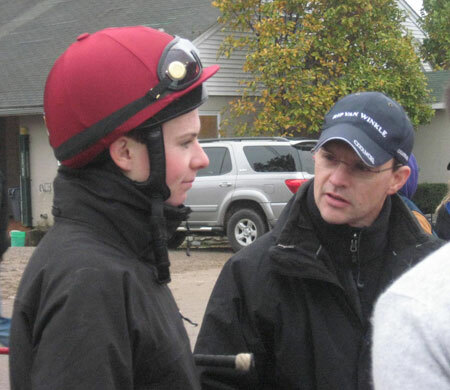 In all, O’Brien’s horses earned a total of $4,105,315 in North America in 2011. His average earnings per starter was $293,237. No foreign trainer and owner have supported American racing like O’Brien and Coolmore, and perhaps it’s time they were rewarded with a well-deserved Eclipse Award. By comparison, Baffert won nine grade I stakes with eight different horses; Romans won six with five different horses; Pletcher won five with five different horses; Motion won four with four different horses; Mott won four with three different horses; and Asmussen won three with two different horses. Most of these trainers have hundreds of horses each. So, for an Irish-based trainer to come here with only 14 horses during the year and win seven grade I stakes with five different horses is pretty remarkable. Having watched the head-on of the TVG Breeders’ Cup Mile (gr. IT) several times, it is hard to believe that the Churchill Downs stewards honestly felt there was no cause for Goldikova’s disqualification. And it is even harder to believe that there was no stewards’ inquiry. The explanation given for the decision made little or no sense, as if they had to come up with something, regardless of how lame it might sound. With that said, however, I am going to ashamedly say I’m glad they didn’t disqualify her and place her last, which is where she would have had to been placed if this were any other race. Let’s just admit it. This was a gift and a “Thank you” for all she contributed to the Breeders’ Cup over the past four years. Although the rules of logic and observation were stretched to the limit, probably going beyond that, it would have been an ignominious and terribly disappointing conclusion to one of the great careers and streaks anyone has ever seen. Olivier Peslier, although guilty of careless riding, had to do what he did. There was no way he could have allowed Goldikova to get trapped behind horses, costing her any chance to win the race with so much at stake. He had to get her out of there at all cost and roll the dice. Was the stewards’ decision fair to the victims – equine and human – who may have lost out from a financial (purse winnings and wagering) standpoint, not to mention the prestige and black-type status? Probably not. But I can only speak from a personal standpoint when I say, although the stewards got it wrong, whatever their thinking was, I’m OK with it. And I’m not alone. What I’m not OK with was the explanation that Byword was equally to blame and that Courageous Cat was wiped out as a result of two horses going for the same hole. Uh, not quite. They should have gone into their book of rhetoric and hollow catch phrases and come up with something better than that. The incident is over and done, and thank goodness we had no public outcries spilling over for months as we did last year. Opinions were expressed and that was it. So, farewell, Goldikova. To the people of France, although this doesn’t rival the Statue of Liberty or your naval support during the War of Independence, please accept this gift from America as a token of our thanks. Another department at Churchill Downs that came under some criticism was track maintenance, due to the dirt surface’s uncharacteristically slow drying out process following a day of rain that turned the track wet and very sticky on Friday and to a lesser extent Saturday. Some used the comparison to peanut butter, others molasses and even oatmeal. Photographers had a tough time trudging their way across the track and many of those walking from the barn area with their horses had their shoes sucked right into the quagmire like quicksand. 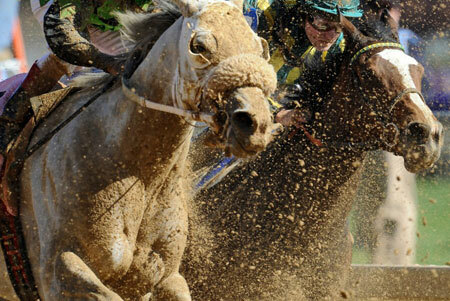 According to several trainers and owners, clay was added to the track right before the Breeders’ Cup. But track superintendant Butch Lehr adamantly denies that. What made this so surprising is that Churchill is regarded as the fastest-drying track in the country, and has been known to turn fast in a matter of hours following a drenching. That, however, is the case in the spring and not fall, according to Lehr. The track dried out very little on Friday and still had large patches of water on Saturday, despite bright sunshine for half of Friday and all of Saturday. Lehr explained the situation. “First off, we added nothing to the track from 2010 to 2011. If I add clay to this track, then the times get too fast. I’m not going to make any excuses other than weather. We went for six months without any rain. All that time we didn’t have a single sloppy track. We had a good rain on Thursday, which came at the worst possible time for us. We had a little wind, but not a lot and there were still a lot of leaves on the trees, which made for many areas of shade. On top of that, we had heavy frost at night. They also built this huge tent on the backside for the Breeders’ Cup owners and trainers to have breakfast and that caused even more shade. Even on Saturday, there was a lot of shade in the stretch because of the shadows from the two grandstand structures on each side of the Twin Spires. As a result of all this, there was still moisture in those shaded areas. Lehr also had his share of controversy on Thursday morning when he refused to allow the horses, mainly the Europeans, to train on the grass. “Some people thought we had a vendetta against Michael Stoute for scratching Workforce the morning of last year’s Breeders’ Cup because the course was too hard,” Lehr said. “That wasn’t true at all. What he didn’t tell anyone was that (Workforce) had a bad foot and wasn’t 100 percent. The Europeans had been on the grass twice that week, and I contacted Adrian Beaumont (of the International Racing Bureau) and told him I would have to close the turf course for training if the weather didn’t cooperate. We were running a stakes on the grass that afternoon and I wasn’t about to compromise any horse’s chances who was running in the stakes. I had to protect the course as best as I could. 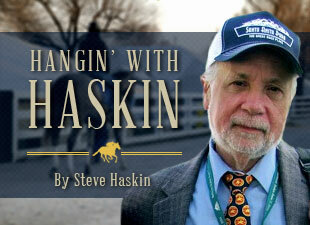 Photos of Aidan O'Brien and Goldikova are by Steve Haskin.